Has anyone played the new Smash Bros on the 3DS? Zero Punctions review of Shadows of Mordor- he doesn't address any lore matters, just looks at as a game and, by his own standards, likes it (well the game bits at least, less so the antiquated story and plotting devises). He's not really talking about the game, more about this other scandal going on right now, but I thought it was really funny satire anyways. There is a PR campaign from WB going on where they payed youtubers to talk about the game, provided they only talked about the positive aspects. So this guy only says negative things even going after the source material. "Also terrible videogame. I've never played, don't even know if it's bad or not; it's a horrible videogame. Don't buy it." Anyone here played Alien: Isolation or the Enemy Within yet? Waiting for some Angry reviews but they both looked interesting. I think there's an Angry review due some time this week or next for Isolation; I'm still waiting for reviews though after that debacle with Colonial Marines. I got Alien Isolation- birthday present. Got the version with the Nostronomo dlc too. I haven't played a massive amount which might say something in itself, but what I have played is, solid. who has marked for death by alien written all over him from the moment you meet him. However the humans are my least favourite part of the game, you will find yourself sneaking by them long before any alien, and I didn't get the game to sneak about bloody humans. For me i would have found the premise of the player, a bloody big empty space ship and a terrifying alien more scary than me and a bunch of idiotic AI humans and an alien on a space ship. But I can see why they did it - to add variation, to move the plot along, give quest objectives- its just they all feel like thats what they are for. Looks and sound wise its absolutely spot on, everything is reassuringly the future as seen from 1978. However I do have a problem with 'things of importance' which glow bright orange when you get close to let you know they are 'things of importance', which is a total immersion breaker (for the same reason when playing Skyrim I turn of big floaty quest markers above everything, so this one might just be me). Save points are a bit annoying too. I get why you cant quick save anywhere, that would kind of kill the threat of the alien, but all the usual problems with save points raise their head- if you have to switch off the game you have no idea if you are right round the corner from the next one or half an hour away. They are not always instantly obvious. They take the form of big chunky telephones with a card slot, but they are not always well placed to be obvious, as although they glow orange they only do so when you approach one. So is quite possible among all the game clutter to not notice ita nd go right by it. Some sort of subtle indication you are in a save area (like Resident Evils 'save room' music perhaps) would have helped here. Or even better have normal save anywhere, but disable it when in encounters. Its also very linear. Yes in areas with the alien it can and will react slightly different dependent on what you do and where you go, but everything else is linear and you are forced along the story path at all other points. So if you are expecting a sandbox space station to explore it aint here. Its as linear as a FPS inbetween encounters. Talking FPS there is also some of that in the game, which I didnt like as I dont want to play a fps, even one where ammo is rarer than gold (th eflame thrower appears to to hold about one single drop of fuel, honestly you would be better off with an aerosol can and a lighter). Its like they dont quite have the confidence in an all stealth sneaky game but at the same time they dont want it to be a FPS either, and the mix is at times a bit awkward for me. You also spend too much time fighting 'working joes'- which are sort of cheap model synthetics that for reasons that never seem clear to me have gone on a murderous rampage. Structurally it also follows Call of Duty, in that you tend to get to a point then there is an impressive but nothing you can do about it 'action sequence' that if your lucky you might have to press a button or two during. But I suppose the big question is, is it scary? And the answer there is sort of. I didn't exactly leap out my chair when playing, but it is very tense when hiding from the alien as it really is hard to predict and your heart does tend to race when it plops out of an airvent close to you. And you will die- a lot. Switching between your motion tracker and your surrounds also works well at creating tension and you are often also plunged into darkness to up the ante. I will have to play a lot more of it to decide if its a good game or not, but so far I cat say its bad game. Just not perhaps as good as hoped. Still by a large factor however the best Alien game I have played and weirdly enough reminds me of the only other Alien game I liked and had tension- which was way back on the Commodore Amiga and was a top down strategic style game. So perhaps its no surprise that the first decent Alien game on a modern system has been produced by a company better known for making strategy games. Recoveryanonymous wrote: I think there's an Angry review due some time this week or next for Isolation; I'm still waiting for reviews though after that debacle with Colonial Marines. I wonder what sort of spec requirements that's going to have. My rig is nothing special mid range at best and I dont have any problems running it on ultra. Supports up to 4k though if you've got the monitor and pc for it. Handy little program with impressive results that I recommend. Razer surround. What it does is gives a very impressive 7.1 surround sound effect to any standard stereo headphones. Ideal for gaming. The basic version is free (you cant alter the default settings but I found they were good anyway) you do have to sign up to download but thats free too and not a hassle. If you want all the advanced options you need to upgrade (and pay) for the pro version. But I have found the free version to be excellent anyway. Thanks RA... I watched the review and sounds like a game I do t need to rush out and buy. Petty... have you been able to play any more? Yeah I've played a bit more, i was just playing the Nostronomo dlc in fact. Still got some issues with it but nothing major enough to be game breaking. And there is no doubt at all, when its just you and the alien out there stalking you there isnt another game I can think of that so effectively goes for heart racing, and heart stopping. You will be wound up tighter than a coiled spring playing it. A large part of it is down to real respect for the alien- what you can do when spotted is pretty few- if you have a flamethrower you might manage to scare it away temporarily, but most commonly all you can do when it spots you is die. And that realy does give an edge to proceedings when dealing with it. That is one game I would like to play using the oculus rift or morpheus... I think those systems would really add something to a game like that. I think they had to add in things like humans and the robots other the game probably would have been very repetitive. Angry Joe made a good suggestion of mixing the survival horror type game that Isolation was going for with a dose of FPS. I think they could probably pull out some of the better parts of all the alien game attempts to create a game like that. Yeah I can see why they did it. Problem is from my experience so far the game is by far at its best when its you v the alien. When its you v humans or synthetics, or just completing tasks it feels a lot less engaging and a lot more generic and see it all before. Its the moments with the alien when it all really comes alive. Agree don the rift- apparently its not officialy compatible, but the code to make it compatible is in it (pc anyway) just not activated- needless to say hackers have been in and turned it back on so now it will work with the Rift. 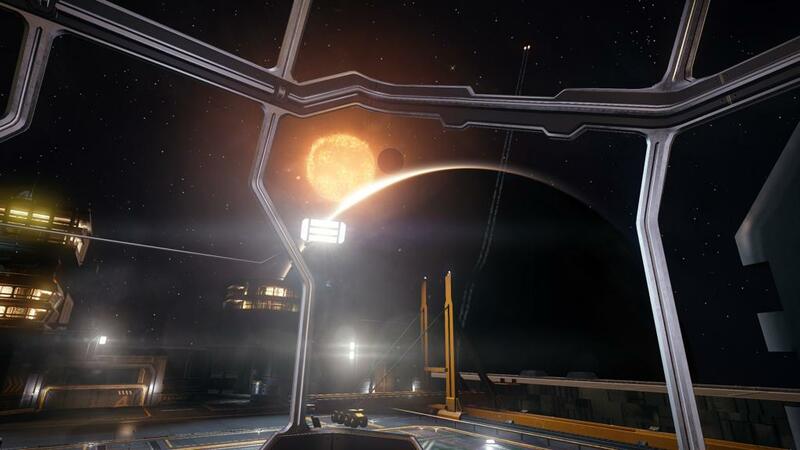 Elite Dangerous is another game that entirely rift compatible and apparently quite brilliant to play with it. Not sure what else you could really do though without what I mentioned. And by FPS I dont mean COD with Aliens... I mean the dame Alien that hunts you and will kill you if it finds you. Only difference in the FPS section is you have brief access to heavy weapons. I think they spent a LONG time on trying to make the alien AI the way it is. They need to do that with friendlies too. Maybe have a team of 4 or 5 of you where the other characters dont just get in the way and you have the possibility of losing them along the way if you dont work with them. Maybe even have tasks you have to do with them but going your own ways much like you would in co-op MMOs. I dont know how much of that there is later in the game, if any, but at the start, not long after you arrive on the station you team up with a bloke who leads you through the opening stages in what is basically the tutorial. This game has me intrigued, the Vanishing of Ethan carter, a ghostly murder mystery. Well my internet's acting up so the video won't even load on my pc! Pettytyrant101 wrote: My little brother is a Halo fanboy. I have never got what is so appealing about it. You mention Half Life, I would say Counter Strike was a more innovative for its time multilayer fps than Halo was for its time. And in the continuing Valve trend TF2 is a more polished multiplayer shooter than Halo. I just seem to be missing what the 'special' thing about Halo is. It looks, feels and plays to me like a generic scifi shooter that as the sequels go on increasingly plays it safe. Halo did give us one great thing: Arby n Chief. I miss that show. Did anyone watch this show? I didnt even know it existed. I didnt really play Halo 3 much though so wouldn't have been something I would have thought of looking up. Recoveryanonymous wrote: Did anyone watch this show? I watched the first two seasons or so, and I didn't know it became more dramatic until you mentioned it once before on here. I might revisit it one day, though at the moment I'm trying not to watch anything too depressing for the first time.